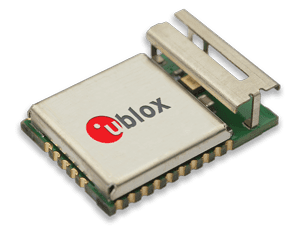 Swiss module and chip developer u-blox has launched a compact single band 802.11n 2.4 GHz Wi-Fi transceiver module aimed directly at applications in the Internet of Things. The module measures just 10 x 14 mm and is suitable for providing Wi-Fi connectivity to an increasingly broad range of industrial and commercial products with LTE connectivity as it has an LTE filter included. Despite Cisco and Apple regarding the 2.4GHz band as too full for reliable IoT links, and Broadcom making different module choices, u-blox is optimistic for its LILY-W1 module as it simplifies the integrator's RF design efforts with an integrated antenna and enables Wi-Fi in-device co-existence with LTE thanks to a bulk acoustic wave filter. Suiting today's space constrained designs, the filter not only ensures that Wi-Fi performance does not deteriorate in proximity of an LTE transceiver, but allows the antennas of both transceivers to be sited close together. The new module also supports Wi-Fi direct. "LILY-W1 is a lower end Wi-Fi solution targeting (mobile) devices which require basic Wi-Fi connectivity such as driving recorders, measuring devices, logistics PDA or POS printers etc," said the company. "These device would mainly connect to end-devices such as smart phones, laptop PCs and tablets being used to control the device and may additionally send data to the cloud via LTE. In a mobile or off-grid application which uses Wi-Fi for basic data exchange (ie not video distribution, the over-crowded 2.4 GHz band does not represent a problem." The module connects to the host processor, either through SDIO or USB, and can operate concurrently in Client and Micro Access Point modes, and up to 8 clients can attach to it as a Micro Access Point. Royalty free Linux and Android drivers are provided as standard. With its extended temperature range from -40 to +85 degrees C, the module suits the growing need for industrial and commercial equipment to become connected. Typical applications can include telematics control units, drive recorders or OBD readers, as well as logistics or point of sales equipment.